Democratic state Sen. Laura Kelly said a 'wave of common sense' helped her beat Republican Kris Kobach to become the next governor of Kansas. A race that looked to be oh-so-close turned out to be a clear victory for Democrat Laura Kelly, the new governor-elect of Kansas. On this mini episode of “My Fellow Kansans” we hear what Kelly had to say on election night and her explanation of what vaulted her to victory over Republican Secretary of State and conservative firebrand Kris Kobach. According to the unofficial tally, she got 48 percent of the vote to Kobach's 43. But at the same time, conservatives picked up a signficant number of seats in the state Legislature. That could complicate the bipartisanship that the incoming governor wants, and that she'll need, to fulfill her campaign promises to do things like ensure adequate funding for schools and expand access to healthcare. A full epsiode of "My Fellow Kansans" with a deeper look at the 2018 election, from a range of perspectives, is coming next week. That coming episode will also delve into which direction Kansas politics is headed. Watch your podcast feeds. My Fellow Kansans is a production of the Kansas News Service, a collaboration of KCUR in Kansas City, KMUW in Wichita, Kansas Public Radio in Lawrence, and High Plains Public Radio in Garden City. The podcast is written and reported by Jim McLean, edited by Amy Jeffries, and mixed by Matthew Long-Middleton. Thanks to reporter Madeline Fox and WIBW for audio used in this minisode. Copyright 2018 KCUR 89.3. To see more, visit KCUR 89.3. Kansas News Service reporters Jim McLean, Madeline Fox, Brian Grimmett, and Steve Koranda round up the results of election night in Kansas from the top of the ballot to the bottom. 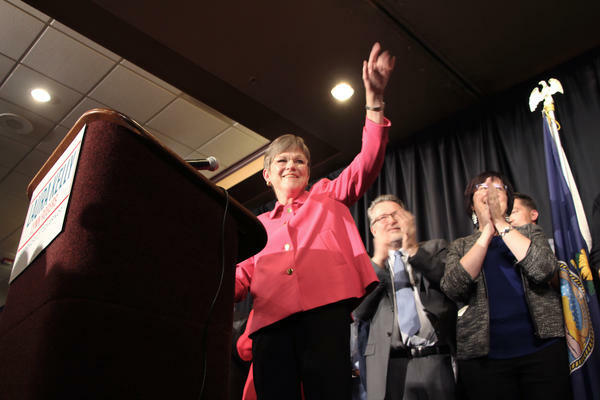 Democrat Laura Kelly fended off perhaps the most energizing and divisive figure in Kansas politics on Tuesday to become the next governor of Kansas. Kelly beat out self-described “full-throttled” conservative GOP nominee Kris Kobach, the secretary of state who’d forged a kinship with President Donald Trump while dabbling in anti-immigration and voter fraud crusades across the country.